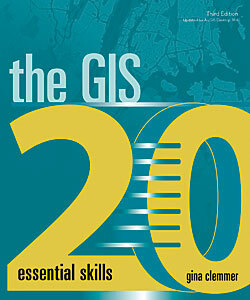 The GIS 20: Essential Skills, Third Edition, helps those who are new to GIS or unfamiliar with it to quickly learn how to perform the basic GIS tasks of mapping, thematic mapping, and geocoding. She avoids discussions of the inner workings of GIS and focuses on providing clear, step-by-step instructions on how to perform the most commonly used tasks and functions such as downloading shapefiles and using essential tools in the software, preparing data for a map, geocoding addresses, making thematic and other types of maps, mapping latitude and longitude points collected with a GPS, using aerial photography in maps, and publishing maps. Clemmer is the president of New Urban Research, Inc., a social research and training company based in Portland, Oregon. She has spent her career teaching GIS to anyone and everyone from New York City executives to the inhabitants of Alaska fishing villages so they can use GIS for making better decisions. The GIS 20: Essential Skills is available in print (ISBN: 9781589485129) and as an e-book (ISBN: 9781589485136) from Esri Press (esri.com/esripress) or online retailers.